Year 6 Residential – Each year in the Spring Term ( March 4th - 8th 2019) the Year 6 children have the opportunity to attend a week long residential with our partner school, Kemble Primary School. We go to the UK Youth Outdoor Activity Centre at Avon Tyrrell in the New Forest. 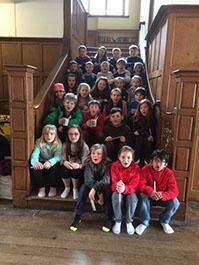 The children stay in a Grade 2 listed building and are busy, busy busy all day taking part in 4 or 5 activities each day. These are a mixture of water and land based challenges and activities, including activities such as rope challenges, zip wires, rafting and mountain biking. To find out more please contact the school office for details. Peripatetic Music Lessons – currently the school offers small group and individual lessons in 10 week blocks with 3 music teachers. To check availability and costs please contact the school office.